RB Jhrull Pressley: Good Pro Day, can he Break Bad? 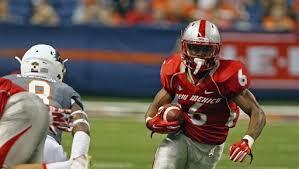 RB-Jhurell Pressley, New Mexico 5′ 10″ 206 lbs. Cons: The former Lobos is not a very physical runner; he lacks power, has small legs, and doesn’t run behind his pads. The back has a bad habit of attempting to break the play outside (even when a few yards available inside, which results in a loss), doesn’t fall forward, and gets brought down too many times from arm tackles. Pressley also isn’t much of a receiver with four dropped passes out of the 18 targets he got in his entire college career. I did not get the chance to see if the runner can pass blocker, either. Pros: Pressley had an impressive pro day: 4.38 40-yard dash, 33.5″ vertical jump, 4.06 second 20-yard shuttle, a 6.92 three cone drill, and an impressive 25 repetitions on the bench press. Some might look at his less than 400 college touches as a detriment, but I see it as upside. In the four 2016 games that he received 17 carries or more, the back ran for 56, 103, 99, and 170 yards. Of course college stats vary greatly, so what was there on tape? The former Lobos has loose hips combined with tremendous foot speed. He makes cuts immediately, usually forcing the first man to miss, sees the entire field well, and possesses an incredible jump cut. Pressley tells stories while he runs with spins, shoulder shakes, stiff-arms, and hurdles. The back is a true one-cut and go runner, who can score from anywhere on the field. The play maker uses good balance, protects the football, and has a nose for the end zone. Overall impressions: This is a raw prospect that could get used as a returner initially if drafted. He might be a lesser version of fellow Mountain West Conference runner Tyler Ervin. His lack of receiving ability hurts his chances at the next level. Pressley is a last round flier to stash in leagues with taxi squads only.